The world’s first and only foaming gel hand soap. A luxurious hand washing experience, the foaming gel soap is efficiently delivered through an attractive, automatic wall-mounted dispenser. 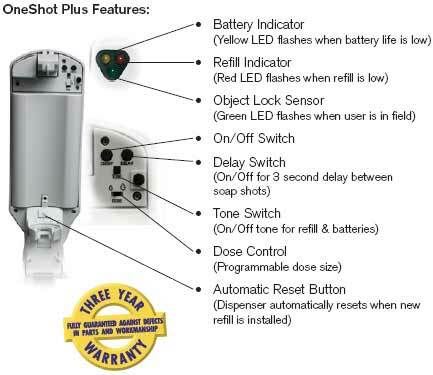 The OneShot Plus dispenser uses state-of-the-art sensor technology, detecting hands and automatically releasing the perfect amount of hand soap. Your washroom visitors will appreciate the touch-free experience. TC Foaming Gel Soap’s concentrated formula and controlled dosage deliver up to 1,000 hand washes per 475ml refill. Luxurious gel formula that produces a rich, foaming lather leaving hands feeling velvety smooth, encouraging healthy hand washing. Automatic touch-free delivery helps eliminate cross contamination and promotes healthy hand washing. The Smart Sensor™ technology detects user’s hands for controlled dosing and guarantees a trouble free operation – no clogs, no leaks, no drips, reducing labor costs and making the system presentable at all times. industry-leading battery life. Up to 60,000 cycles or 3 years.